UPDATED: Oct. 1, 2014, at 11:40 p.m.
Pan Shiyi and Zhang Xin, the couple who co-founded China’s largest commercial real estate company and donated $15 million to the University last July, shared their views on education and philanthropy with hundreds of students on Wednesday in a filled Science Center B. The pair, which Forbes dubbed one of the “World’s Most Powerful Couples,” currently heads the real estate developer SOHO China Ltd. as well as the philanthropic organization SOHO China Foundation. Philanthropist Pan Shiyi speaks about his scholarship donation and the importance of education in the Science Center on Wednesday. Shiyi and his wife Zhang Xin started the SOHO Scholarship foundation, aimed at bringing Chinese students to elite universities. Last July, the foundation launched the $100 million “SOHO China Scholarship” to provide financial aid for Chinese students to study at the world’s top universities, starting with a $15 million gift to Harvard. 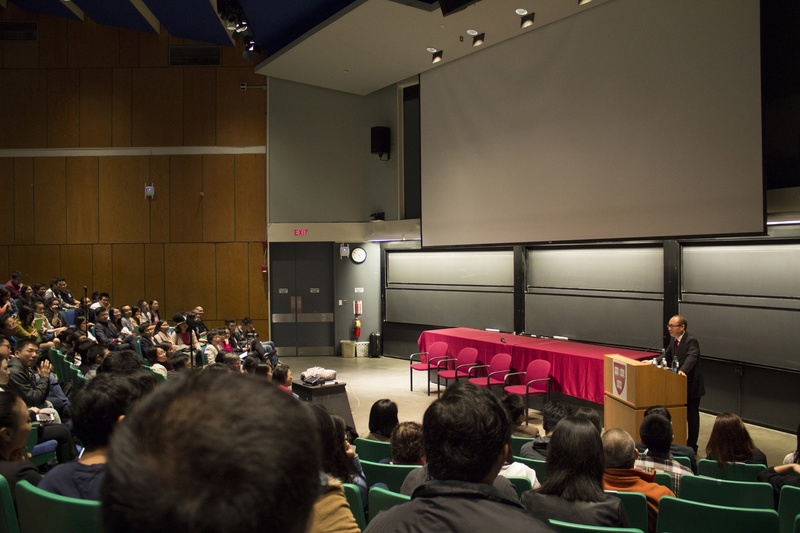 Co-hosted by Harvard China Fund and several Chinese students’ groups on campus, Wednesday's event was conducted mostly in Chinese because many audience members were Chinese nationals. William C. Kirby, a professor of Chinese studies, introduced the couple by recounting their respective rags-to-riches stories. Zhang worked as a factory girl before studying in the United Kingdom on financial aid. Similarly, the opportunity to go to college was life-changing for Pan, who was born in rural China. “I’ve always thought that one’s relationship with society is in an equilibrium. The more you give, the more you will gain,” Pan said in Chinese. The couple, who has a combined 25 million fans on the Chinese Twitter-like social media platform Sina Weibo, faced severe criticism in China after announcing their donation to Harvard. Currently, eight Chinese students at Harvard College have benefitted from the SOHO China Scholarship. Zhang said that even though China produced close to 10 million high school graduates last year, less than 500 applied to Harvard College. The three tickets vying for the Undergraduate Council’s top spots began their campaigns by blitzing constituents with fliers and Web sites yesterday. By now, you probably know that George J. J. Hayward ’11 and his running mate Felix M. Zhang ’11 are contending in the Undergraduate Council’s presidential elections this year, with a platform built on hot breakfast, campus safety, and budget cuts. Hayward's approach and commitment to execution will be exciting to watch when enhanced by the leverage that comes with the UC president’s position and complemented by Zhang’s leadership experience on the UC and in student groups.